WHO/Europe has developed a guide to dietary intake modelling that countries can use when designing national salt reduction strategies. The 5-step approach describes how countries can map dietary intake and food composition data to identify the most important food sources of salt in their population’s diet. Based on this, countries can develop appropriate targets for food product improvement that, if achieved, will contribute to meeting the global target of a 30% reduction in population salt intake. 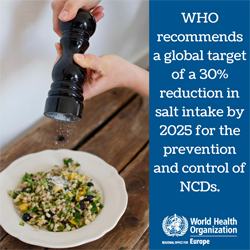 The amount of salt consumed in the WHO European Region considerably exceeds the recommended levels, and salt reduction is a priority of the WHO European Food and Nutrition Action Plan 2015–2020. Excess salt intake causes raised blood pressure and thereby increases the risk of cardiovascular diseases – namely, stroke and coronary heart disease. Many countries in the Region have developed and implemented national initiatives related to salt reduction. However, in many cases progress has been patchy and impact on salt intake less than expected. As such, there has been an increasing demand from Member States for more specific guidance on salt reduction policies, based on best-practice examples from the Region and beyond. The 5-step approach enables policy-makers to understand which products contribute the most to salt in the diet and where changes are necessary to reduce population salt intake. The guide contains advice on data collection and methods, and provides explanations relating to limitations and challenges that countries might face. To provide inspiration to countries considering developing a salt reduction model, the guide gives an overview of existing sodium targets for manufactured foods in selected European countries, alongside the sodium criteria for labelling and taxation policies. It also demonstrates the applicability of the 5-step approach through case studies from Kazakhstan and Turkey illustrating the process of developing salt models. WHO/Europe developed the guide together with the WHO Collaborating Centre on Population Salt Reduction at The George Institute for Global Health in Sydney, Australia. Funding for this publication was partly provided by the European Commission Directorate-General for Health and Food Safety. We also acknowledge the funding support of the Government of the Russian Federation within the context of the WHO European Office for the Prevention and Control of Noncommunicable Diseases (NCD Office).